Sunny Monday morning greetings from Las Cruces, NM.! You would think that by coming down here to see my folks this past week that I would have avoided some of the cold snowy weather that everyone was getting back in the Midwest. Wrong! The temps were supposed to be in the 60 degree range (and they were before I got there) and unfortunately they ended up having some of the coldest temps in their history. Having the high is the 20 degree range and the lows below zero wasn’t the type of weather that I ordered for my visit!!!!! The other thing that Las Cruces got this past week was a very rare snow storm. 2.5 inches to be precise and in the six years that my folks have lived here, they maybe have had snow in the city 3 or 4 times, so it’s rare indeed!!!! Even though I’m not all that wild about shooting in cold weather, I had to take advantage of the snow and get a few snaps! 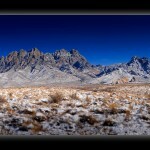 Here’s one of my snaps of the Organ Mountains with a fresh dusting of snow and it sure was special to see!!!! Thanks as always for checking out my weekly photos and I hope that you have a great week!!! !